When people think of a “Road Trip” it is often understood to be a time to jump in the car for an exciting, schedule-free, no-stress, low-budget and relaxing adventure on the open road. It’s the perfect time to explore new locals and secret hideaways off the beaten path, taking whatever turn that suits their fancy en route to a final destination for some more R&R. It is almost NEVER thought of as grueling 1551-mile, 14-day handcycle ride – propelled mostly by your arms and upper body – that covers more than 130 miles per day and features approximately 16,000 feet of climbing over varied terrain in who knows what kind of weather. Yet, that latter example is exactly the kind of road trip that paralyzed Indiana Army National Guard Specialist (Ret.) Ricky Raley plans to embark on Monday, Aug. 13 when he launches the “Raley Road Trip: Cycling It Forward to Benefit Boot Campaign.” It is an ambitious ride down the Eastern Seaboard from New York City to St. Petersburg, Fla., and a trip that could potentially qualify for a handcycle world distance record. 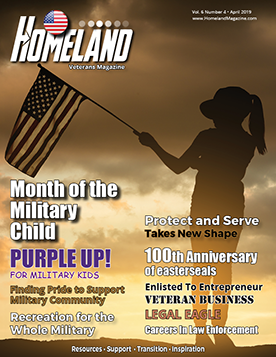 This unusual excursion is the brainchild of Raley, a Boot Campaign Veteran Ambassador and native of Sullivan, Ind., who is making the trek on behalf of the Texas-based military non-profit’s revolutionary health and wellness program. He recently completed the program in June in an effort to improve his mental and physical capability, nearly a full decade after medically retiring from his six-year military career. Raley’s experience in the program sparked an overwhelming desire in him to give back, as well as a passion to ignite the inner patriot of all Americans and raise awareness of the service and sacrifice of the military community. His primary goal along the August ride is to raise $150,000, the estimated cost of sending up to five veterans through Boot Campaign’s whole person – brain and body – approach to health and well-being. Each veteran in Boot Campaign’s program is connected to crucial services according to individual need. Treatment and training programs include scientifically validated protocols for traumatic brain injury (TBI), post-traumatic stress disorder (PTSD), chronic pain, self-medication and sleep disturbances. Depending on the services needed, the cost can reach up to $35,000 per participant, featuring assessments and treatments conducted by some of the world’s leading medical experts and therapists in both Dallas, Texas and Virginia Beach, Va.
A former infantryman in the Indiana Army National Guard, Raley served in the Guard’s Alpha Company, Task Force 1-151 – better known as the Avengers – who were deployed to the Middle East as part of Operation Iraqi Freedom. During one combat tour, the Avengers conducted more than 200 combat missions and covered more than 250,000 miles in convoy escorts. On one mission in 2008, Raley’s truck was leading the way when the mine roller tripped an IED (improvised explosive device). Ricky, along with two others in the truck at the time of the explosion, sustained mild traumatic brain injuries and were awarded Purple Hearts. While Raley was able to walk out of Iraq in 2009, it was only six months and 17 days after returning to the states that he was involved in a near-fatal, off-duty truck accident. He says after the truck flipped a few times “it landed on me and crushed my T12 (thoracic) vertebra” leaving him paralyzed from the waist down just five months before the birth of his son Pierson. Despite many challenges, Raley only slowed down for a short while as he learned to adapt. Active and into sports before suffering his injuries, it was natural for him to have the desire to tackle the challenge of adaptive sports. He started by training in handcycling and then became competitive in wheelchair basketball. 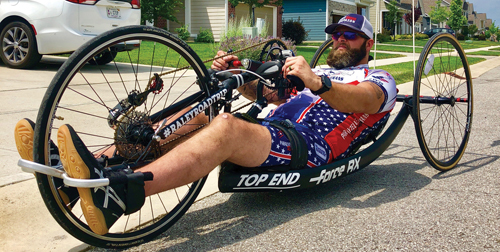 In just over a year after his truck accident, Raley was competing in his first marathon on a handcycle, and has gone on to compete in multiple races in varying lengths and states. Even though much time has passed since the accident and his son is already approaching his ninth birthday, Raley has still found new reasons for optimism. During the second phase of his Boot Campaign treatments at Virginia High Performance (VHP) in Virginia Beach, his trainer noticed an overlooked strength in his legs and adapted a customized apparatus on site to maximize his leg-strength training. “At VHP I was doing what looked like leg presses, and that was stuff I didn’t know I had in me,” Raley admits. “When I first started that, you could barely tell I had any leg strength. But the trainer, Tim Kelly, really pushed me and kept pushing. He believed I could do it, whether or not I believed it. The next thing I know we are setting up this contraption to try to do leg presses. By the time I left VHP I was able to push out these bands that equaled 60 to 100 pounds of resistance, and control them back in. This is huge for someone who can’t move their legs! Raley recently chose to transition from competing in adaptive sports to advocating after he realized what he truly cares about is making sure America makes good on its promise of giving veterans the best quality of life possible. He currently serves in a new role as factory pilot and spokesperson for Invacare® Top End®, a division of the Elyria, Ohio-based Invacare® Corp., the world’s leading manufacturer and distributor of medical products which promote recovery and active lifestyles for people requiring home and other non-acute health care. In the upcoming Raley Road Trip, he will ride in three different models of the Invacare Top End line of handcycles. Raley has been training in the Force RX handcycle, but also will utilize the Force G and Force-3 models depending on the terrain and weather. According to the plan, his way from New York to Florida will include a large mid-point event in Virginia Beach with the support team, VHP founder Alex Oliver and the local Navy SEAL community that symbolically marks the end of the ride’s steepest Northern section. It also is where he expects to be joined by several SEALS who want to ride along with him to the Virginia/North Carolina state line. The road trip’s official finish line will be in St. Petersburg, the back-yard of Invacare Top End’s Tampa manufacturing plant which produces all of the company’s sports-related handcycles, basketball chairs and wheelchairs.